(MATT) We arose and pushed on to Zaragoza. I didn't really want to stop, my argument being we didn't really have anything to see. But we stopped anyway, luckily because it was Jon's favorite basilica so far. Jon will tell you about you about later. It was called "Our Lady of the Pillar." Well, not really; I'm just giving you the English translation of the name to make it easy for you readers back home. I just want to say that the Lady was about 12 inches tall and the "pillar" was maybe two feet tall. But... size isn't everything... so they say. We went to the cathedral as well but they were doing renovation so we couldn't get in. Then on to Barcelona, "Cosmopolitan Capital of Europe," "The Paris of the 90's," "possessing the most beautiful street in the world." (Let's Go 1994) Well we saw a temple/church Sacred Family that has been under construction for the past 100 years. It was different; Jon was fascinated by the construction and claimed he would like to stay there for five years and learn the trade. Well, maybe if Sherry were there to help mix the mud. We walked to the cathedral, couldn't get in and bought ice cream to celebrate our existence. Then it was on to the "most beautiful street in the world." We were expecting at least a beautiful street and some sword swallowers that Let's Go promised. 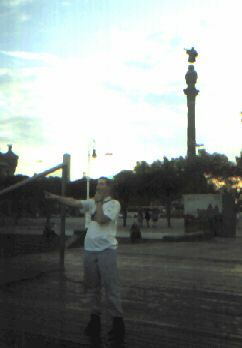 But we made the best of it, walked to the end of the street where a giant Christopher Columbus statue stood pointing out into the Mediterranean... hmmm... how odd. 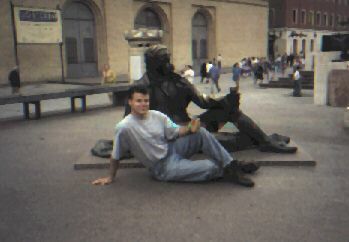 Then we walked back up the street to the fountains, watched young couples making out, discussed the morality of such acts, and decided to work our way back to the car. We stopped at a sandwich shop that looked very much like Subway and decided to splurge and eat dinner. Jon thought that four girls in the corner were speaking English. Chris was pushing us to eat at the car, but after we explained the opportunity, he was more than willing. Jon sat a table by the door and waited with the guys while I sat at a table next to the girls. I listened to their conversation for a few minutes enjoying being able to understand what they were saying. I don't think they knew I was listening to their conversation. They were discussing how much milk to put into cereal and which cereal leaves the best milk after. After a few minutes of their conversation, I joined in by pointing out that Captain Crunch is the best. I think they were a little surprised but who can argue a point like that. Jill (we found out their names later) quickly agreed and added that Crunchberries were excellent and Elaine (a nurse) countered that Peanut Butter Cap'n Crunch was better still. As the conversation continued, Jon joined us followed shortly after by Chris and then Sam. We had an excellent conversation for about two hours and all enjoyed ourselves tremendously. I'm coming to realize that I am addicted to conversation and constant person to person stimulations. I need people so I'm a conversation junkie. Anyway, they all graduated from college together two years ago (same as us except Chris) and roomed together (same as us, mostly) and went to a Catholic college (another similarity). They were taking trains and staying in hostels... umm, different. They were pretty funny (comma optional for those single Tumbleweeds) and lively. They told us about some of their beach experiences, which we haven't encountered yet and how it is difficult to get money out of your money belt when wearing a dress. They were traveling fairly low budget but not as low class and beggar-like as us. We were bragging about how poor we were and pointed out that we didn't even buy Cokes to go with our sandwiches. They laughed and pointed out they didn't either. It was fun and refreshing and we all enjoyed every minute. We also quoted movies back and forth (Monty Python was a favorite) as well as TV shows (Seinfeld, etc.) It was such an odd thing to meet fellow American travelers across the oceans and quote the same movies with them--what a country. It really is the Age of the Television and I love it. About midnight, hours after we had all finished eating, Chris remembered that we had parked the car on what we thought was a dark alley in the day time. In Spain, where we were warned that anything valuable would be taken from your car... while you were in it... in the daytime. As we walked back to the car, Jon expressed his concern that we might get jumped. But from my point of view, very few people would jump four big guys walking down dark alleys--If they did jump us, we probably would have taken their money to show them how it feels. We arrived at the car to find that although it was still there and our stuff still in it, we had very nearly been robbed. The trunk lock was bent and looked ill-used. The car had been hit in the drivers side rear which knocked the passenger side into a wall. The driver side rear view mirror was also knocked way out. But we still had our car and stuff. And it was a good lesson. In our defense, we had only planned to be on the street for an hour or so but stayed for a good five hours. I was able to fix the spot we had been hit in by popping the metal out. Jon fixed the rear view mirror and the scratch on the passenger side is barely visible. So we are very, very lucky. Live and learn. My Pappy always said if you don't live and learn, you're either dead, dumb, or drunk. Guess we'll learn. So we took off. I was driving and it had been raining. On the way out of the city, we came upon a traffic circle rather quickly and we slid about 80 feet, stopping right next to the car we were supposed to stop behind. Luckily. So we had several close calls that day. Sam took over driving and we eventually found a camp site, sort of. It was just a patch of grass on the side of a back road with trash all over it and a bush in the middle. I slept very well, being situated on top of the bush, but Sam, being on some bottles, didn't sleep so well.